Last revised on November 23. 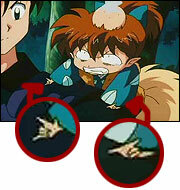 In the anime, there are times when the characters make hand gestures for that split second of being in shock. This article seeks to show you the scenes in which they occur and the meaning behind these gestures. This is the American sign language for I love you. It combines the hand shapes for I, L and Y into one. This handsign represents the head of goat in ancient paganism, which in turn symbolizes the devil (said to be half-man, half-goat). This gesture is used by heavy metal and rock music in the 70s to convey the dark roots of the music. Now, many punk rockers use this gesture to represent 'rock on', without knowing the meaning of this handsign. Here's an interesting article to read. 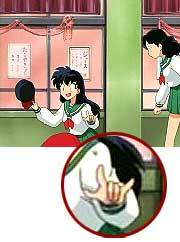 I just wanted to all a little note about the "punk rock" hand symbol you have not4ed in several places on your site. I come from a southern European family for which such a symbol was very familiar and was used for several different purposes. It could at times mean "a man's wife is unfaithful", or "you are cursed with the Evil Eye", or even as a good luck charm (here the thumb would be crossed over the 2 middle fingers or even held flat against the side of the hand). One final meaning is the opposite of the "Evil Eye curse". It is to ward off the Evil Eye, or bad luck in general. The were subtleties in the gesture that changed its meaning and, unfortunately, my grandparents who were well versed in the symbolisms, are long since dead. However, the culture in question here is that of Japan. 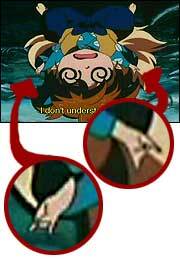 It seems by the way the hand gesture is used in the anime that it is intended to be a warding symbol to defend against bad luck or ill intentions from another person. Kind of like a "god help me" wish. I doubt that any American Sign Language hand signals would be meaningful in Japan, especially 15th century Japan. 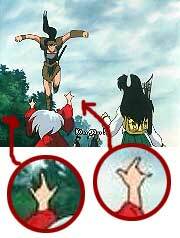 And these symbols do fit in with some of the other hand gestures that clerics, like Kikyo & Miroku make. If so, this hand symbol would have been fairly universal across several cultures. I remember something of the hand symbols and I know that fingers up versus fingers down changed the meaning of the gesture & that fingers down was a really bad thing to do. My family always kept the red horn of fortune (it was a twisted single horn with a crown-like cap covering the base) somewhere in the house at all times. At least two of these objects would screw open to reveal a miniature hand making the horn gesture inside. So the "good luck" aspect of the gesture was widely used at least until the 1960s. 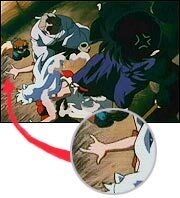 I laughed the first time I saw the gesture on Inuyasha because it reminded me of my grandmother. 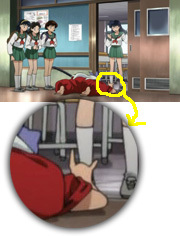 She would make exactly that gesture without extending the thumb. 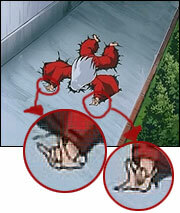 Perhaps the thumb extension was a native Japanese adaptation of the gesture? If so, then it would mean "protect me from the Evil Eye or bad luck or the curse of another". Historically, the story seems to take place within 10-15 years after the introduction of firearms into Japan by the Portuguese. Since their culture is similar to the Sicilian background I grew up with, that may have been the source of contact. I do know that, at least in Sicily, pagan practices got mixed up with Catholicism nearly 2 millennia ago and that hand gesture was probably part of the merger. Hence the "god help me" or "lord protect me" interpretation. 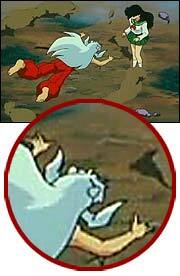 I guess Inuyasha was trying to ward off the bad luck he was experiencing at the moment. EP20: Despicable Villain! 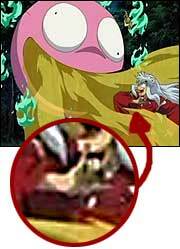 The Mystery of Onigumo! EP39: Trap In A Duel To The Death!